Top-order batsman’s century and an all-round performance from Richie Berrington help chase down Afghanistan’s 255 with seven wickets to spare. 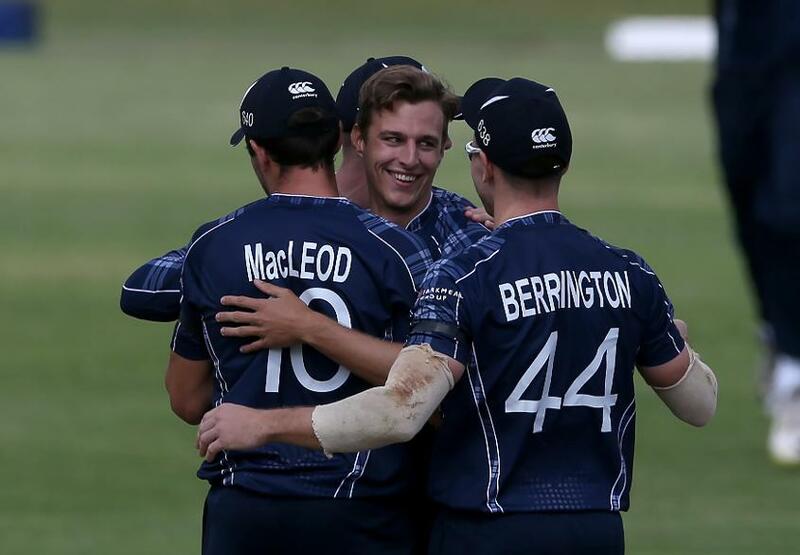 A calm century from Calum MacLeod and his national record 208-run stand for the third wicket with Richie Berrington gave Scotland, the defending champions, a comfortable seven-wicket win over Afghanistan in the teams’ opening match of the ICC Cricket World Cup Qualifier 2018 in Zimbabwe. MacLeod and Berrington, who also put in a strong show with the ball earlier, helped lift their side from a tricky position, finishing the good work the bowlers had started in their Group B match at Bulawayo Athletic Club on Sunday, 4 March. Mohammad Nabi had performed a similar role for his side in the first half, but in the end it wasn’t enough. His brisk 82-ball 92 had rescued Afghanistan from a shaky start and guided them to 255. Najibullah Zadran gave him good support in a 149-run stand for the fifth wicket, before Scotland fought back at the death. They took that fighting spirit into the chase. Mujeeb Ur Rahman, the 16-year-old spin sensation, shook Scotland early. He sent back both openers – Kyle Coetzer and Matt Cross – within six overs, both of them well beaten by his leg-spin. MacLeod and Berrington, to their credit, stayed positive and steadily rebuilt from 21/2. MacLeod grew increasingly confident in tackling Mujeeb, and Rashid Khan, who had become the youngest to captain any country in a one-day international, went for 10 runs in his first over as MacLeod went on to bring up a run-a-ball half-century. The hundred came from 99 balls in the 31st over of the innings. After that, MacLeod went into cruise mode as Scotland looked comfortable to take revenge for the heart-breaking loss they suffered at the ICC Cricket World Cup 2015. Berrington, meanwhile, was the perfect foil, doing well to rotate the strike. His half-century came off 68 balls, with the pulled boundary only his fourth for the day. Their partnership was Scotland’s highest for any wicket, overtaking the 203 that openers Gavin Hamilton and David Watts added against Canada in 2009. Berrington fell to Rashid for 67 off 95 balls, trapped in front while going for a sweep, with the team score on 229. But MacLeod had little trouble knocking off the remaining runs. He finished on 157* off 146 balls, with 23 fours and one six. That is the second-highest individual score for Scotland, and he now has four of his country’s top five ODI scores of all time. Earlier, having won the toss, Scotland put Afghanistan in on an overcast morning and the new-ball bowlers enjoyed the conditions. Brad Wheal knocked out Ihsanullah’s stumps to send him back for a duck in the very first over. Safyaan Sharif combined with Wheal to keep the batsmen, including the big-hitting Mohammad Shahzad, quiet. Berrington, introduced in the seventh over, struck with his first delivery, getting the in-form Rahmat Shah to send a nick through to the wicket-keeper. He then reduced Afghanistan to 71/4, getting rid of both Nasir Jamal and the struggling Shahzad. Nabi, though, played with intent. He was comfortable against the spin of Tom Sole and Mark Watt, not only finding the ropes but also keeping busy between the wickets. Already scoring at a good rate, he took it up a notch after his half-century, smashing three sixes. Najibullah gave him good company, scoring as freely. He too brought up his half-century with a four off the 59th ball he faced. He would make 67 in 69 balls, including six fours and two sixes. When both set batsmen fell in consecutive deliveries of the 42nd over – Najibullah caught off Wheal looking to go big and Nabi run out by George Munsey – it was Scotland’s chance to check the scoring. 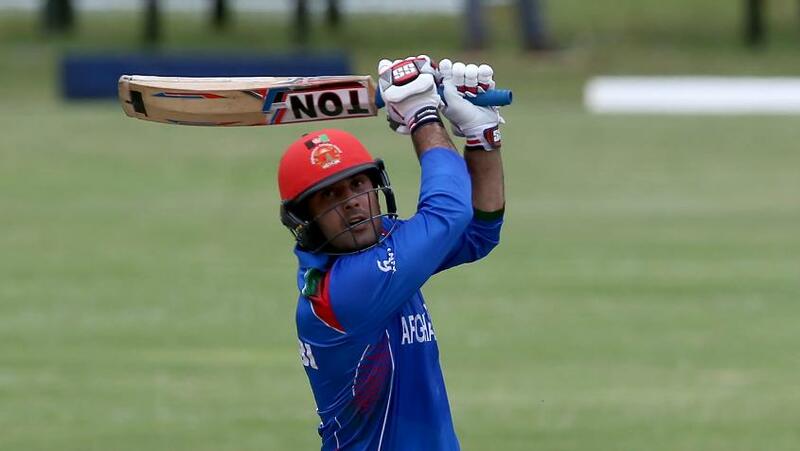 That they did as the lower order folded and Afghanistan were bowled out in 49.4 overs. Wheal (3/36) and Berrington (3/42) were the pick of the Scotland bowlers.